This is a PREDATOR that has destroyed countless lives and familes, a coward, liar and fraud. Why did the city stay quiet so long? 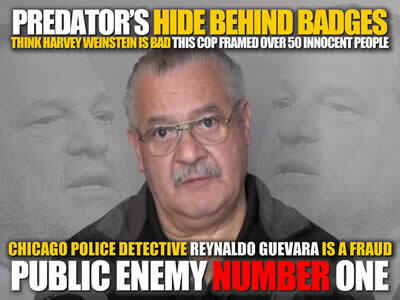 Chicago Police Detective Reynaldo Guevara is accused of framing at least 51 people for murder. When a group of mothers, aunts and sisters found that no officials — not the state’s attorney’s office, not the mayor’s office — wanted to take up their cause, the women went in search of justice themselves. Next week a man convicted in one of detective Reynaldo Guevara’s most dubious cases will be in court for what could be his last chance at freedom. Will prosecutors continue fighting to keep Roberto Almodovar behind bars? In a bizarre twist in the long saga of a Chicago detective Reynaldo Guevara who allegedly framed dozens of Latino men for murder, Cook County prosecutors are now said to be considering immunity for retired gang crimes unit Detective Reynaldo Guevara. The latest development comes as new State’s Attorney Kim Foxx wrestles with how to handle a number of Detective Reynaldo Guevara-linked appeals that are in the pipeline – and it may reflect confusion on her part regarding how to proceed. To attorneys for some of the men Detective Reynaldo Guevara allegedly framed, it’s unclear how giving him immunity would add to the credibility of the prosecution. Detective Reynaldo Guevara was most recently in the news when two more men who said Detective Reynaldo Guevarae framed them had their decades-old murder convictions overturned. Prosecutors agreed to drop charges against Roberto Almodovar and William Negron, but only after arguing strenuously in court to defend their convictions – and then offering to free Almodovar if he would plead guilty, an offer he refused. Days later, another exonerated man sued Detective Reynaldo Guevara, several of his fellow officers, and two former prosecutors, including a current Cook County judge. Prior to these developments, at a March 21 court date in yet another case, prosecutors said they were considering granting immunity to Detective Reynaldo Guevara and compelling him to testify in order to defend the murder convictions of Arturo Reyes and Gabriel Solache, according to new filings by attorneys for the two men. A Cook County judge Wednesday ordered former Chicago Police Detective Reynaldo Guevara to testify under oath about allegations he beat confessions out of two men who say they were wrongfully convicted in a 1998 double-murder. After a hour-long hearing, Judge James Obbish ruled that Guevara – who has asserted his Fifth Amendment right and refused to answer questions about his interrogations of Gabriel Solache and Arturo DeLeon-Reyes – will take the stand in October to answer questions about the case under a grant of immunity from prosecutors. Guevara will be subpoenaed to testify as soon as Oct. 17, in a hearing that will likely see the courtroom gallery filled with defense lawyers and civil rights attorneys who have clients who claim they were framed by Guevara during his three decades as a gang detective on the Northwest Side.